AG "The Vera Skirt" in denim with whiskering & fading. Approx. measurements: 15.5" rise; 16.5" back length; 37.5" bottom opening. AG "The Vera Skirt" in denim with whiskering & fading. Approx. measurements: 15.5" rise; 16.5" back length; 37.5" bottom opening. A-line silhouette. Five-pocket style. Mini length. Button/zip fly; belt loops. Cotton/polyurethane. Machine wash. Made in USA of imported material. 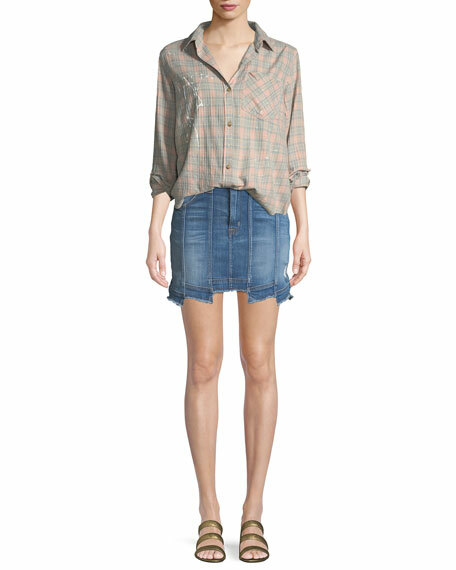 Atelier Notify "Malia" skirt in medium-wash stretch denim with fading. Mid rise; belt loops. Exposed zip front. Side pockets; back pockets Straight silhouette. Knee length. Cotton/elastomultiester/spandex. Made in Italy. EXCLUSIVELY AT NEIMAN MARCUS FRAME "Le Mini" skirt with contrast panels. Approx. 14.5"L down center back. A-line silhouette. Five-pocket style. EXCLUSIVELY AT NEIMAN MARCUS FRAME "Le Mini" skirt with contrast panels. Approx. 14.5"L down center back. A-line silhouette. Five-pocket style. Mini length. Button/zip fly; belt loops. Cotton/polyester/spandex. Machine wash. Made in USA of imported material. Hudson "Sloane" denim skirt with heavy distressing. Approx. 20.5"L down center front. High rise; fold-over waistband. Contrast belt. Five-pocket style.